This light weight system gives optimal exposure surface in comparison to size and weight. The entire tower is manufactured in-house and the three sides are then transported out to the customer location where they are installed in just a few hours. Each tower holds nine to fifteen frames, which are custom made to make switching campaigns and announcements (prints) quick and easy. Our Exposure Tower is not only a complete product, it comes with a complete service as well. All you do is tell us the content for the frames and we will produce, transport and install the tower at your location. 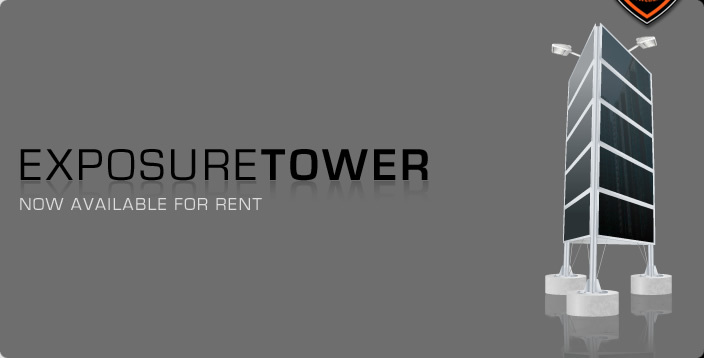 The tower comes fully equipped with our own Wall Frames, prints (both back and front print), lighting and concrete foundations. 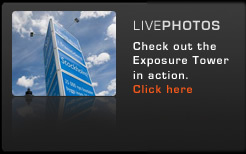 Examples of areas where our Exposure Tower could be used is construction areas, events and sport arenas. Live photos of the Expo Tower in action. The entire tower is reusable and and the exposure material is 100% recyclable. *The height of the towers are excluding the height of the concrete foundations.